Have you seen the heaven on the earth? Do you want to see and stay there? If so, then you can fulfil your desire whenever you want it to be. Lakshman Sagar is a hidden treasure of Rajasthan. It is located in Pali District of Raipur, Rajasthan. 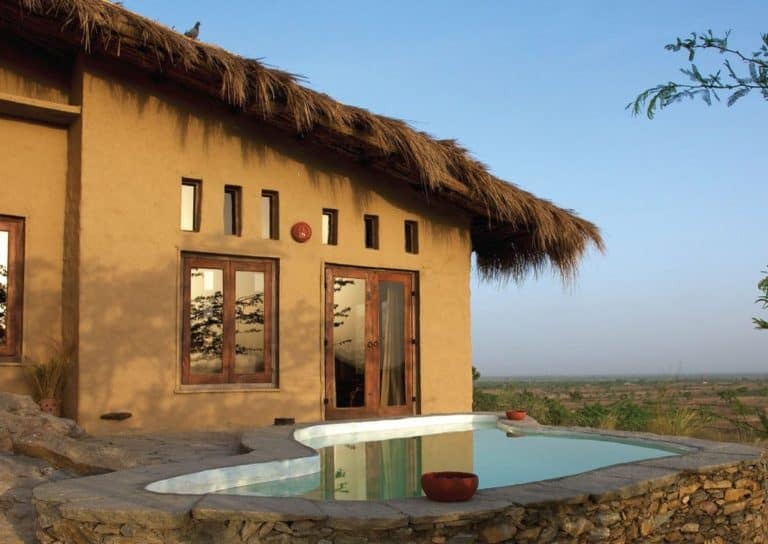 Lakshman Sagar is a resort that will allow you to forget your busy life and grasp the feeling of being relaxed. In the 19th century, the then King Lakshman Singh, had built this place for royal families and British delegates. There are a total of 12 cottages that have been made in the direction of experienced design architects. Out of these, 6 cottages are such that on both sides the lake becomes visible. Each cottage has its own private pool, where you can see the sun going down while relaxing, and also can enjoy the panoramic view of other wonderful scenes. The furnishings like furniture, cushions, pots, etc. have been made available locally. There is also the convenience of campfire meals & live cooking and you can also make your menu according to your own requirements. Here the seasonal ingredients are grown itself or made available locally. Lakshman Sagar is not just a hidden gem from Rajasthan but it is also known as a perfect romantic spot. By spending some days here, you will feel relaxed and forget your busy life, and staying here for a few days will make you feel connected to the rich culture of Rajasthan. To make your holidays memorable, you must take the pleasure of local activities. Goat herding, house trailing, local liquor tasting are the activities. Apart from this, you can see the stars from the balcony of your room at night or you can also take a night walk and feel the natural cold air. Apart from all these activities, there are many more things you can experience here. Such as meditation and yoga, vegetable harvesting, breakfast facilities in the fields, visit the local village, a tour of Raipur, jeep safari, trek adventure for Fatehgarh fort, and live cocktails and barbeques. Lakshman Sagar is about 4 hours away from Jaipur via NH48 and 2 hours from Ajmer via NH58. If you want to reach here via air travel, then Jodhpur airport is the nearest one, which is about 2 hours away by NH25. If you want to go via rail then Haripur railway station is 3 km away.